As the year advances to it's end, the holiday season is rapidly approaching and we are beginning to plan our shopping and looking for the best prices on the lovely things we want to gift to our friends and loved ones. One favorite gift to give and to receive is fragrance, which can be expensive. Happily, there is a place to buy your or a favorite person's favorite scents and save yourself a little money, in the process. 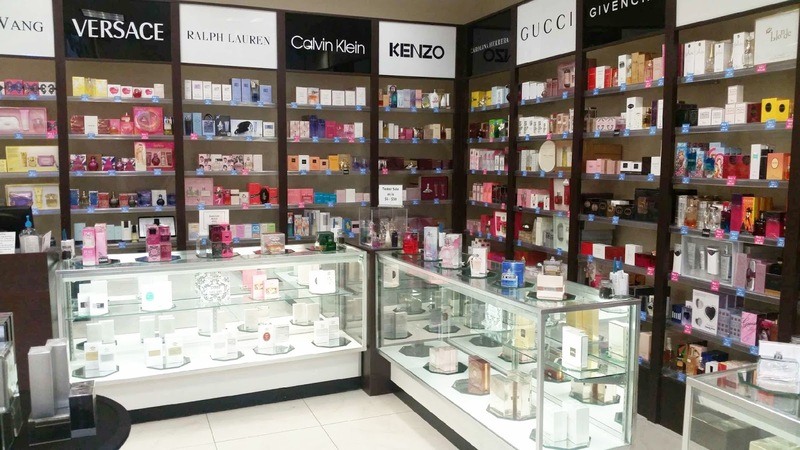 Fragrance Outlet is one of the nation's largest retailers of fine and designer fragrances and accessories and a perfect place to do some shopping for pretty and lovely smelling things for those on your gift list. 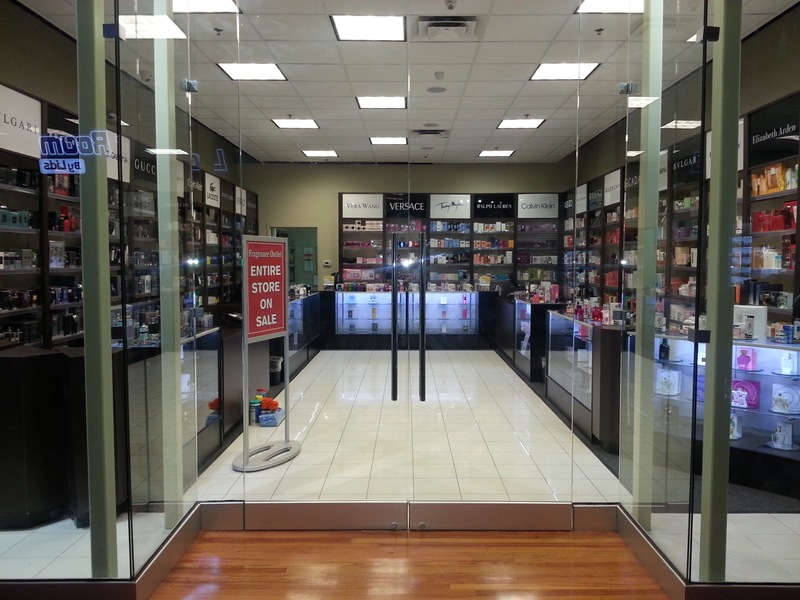 First opened in November, 1990 in the Potomac Mall in the Washington, DC area Fragrance Outlet has grown to over 100 fine fragrance stores and fragrance outlets, nationwide. Try their Store Locator to find a location in your area if you'd like to shop in store. Or you can stay in your pajamas and messy bun, avoid the teeming holiday crowds and Shop Online. My preference, if I'm to be perfectly honest. I enjoy a good get out and shop till I drop as much as the next girl but I strongly dislike over crowded stores, malls and other locations and I will do whatever I can to avoid them. Shopping at Fragrance Outlet is easy as can be. The site is laid out to be easy to navigate and find what I want. The check out process is easy, swift and smooth and secure. I received an order confirmation at once and another when my fragrance shipped with an estimated date of delivery and a tracking number. My package landed on my doorstep ahead of my delivery date and arrived intact and well packaged. 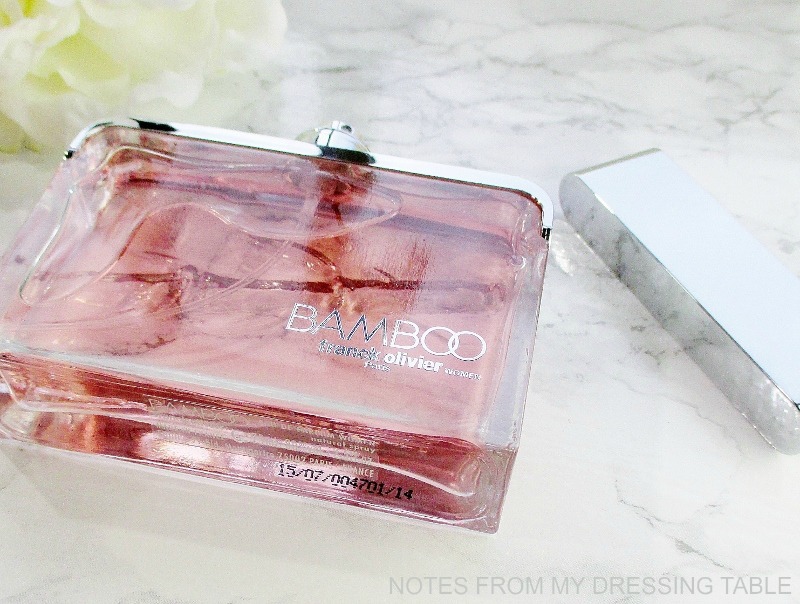 The fragrance I received for review is a Fragrance Outlet exclusive, Bamboo Eau de Parfum for Women by Franck Olivier. 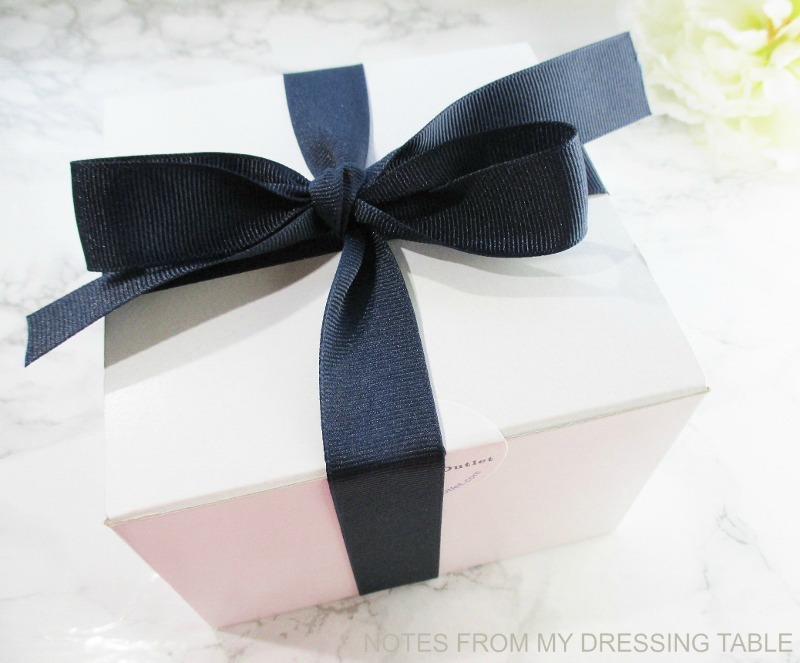 My fragrance arrived prettily presented in a heavy, crisp white card stock box wrapped and tied with a dark blue grosgrain ribbon bow and secured with a Fragrance Outlet seal sticker. 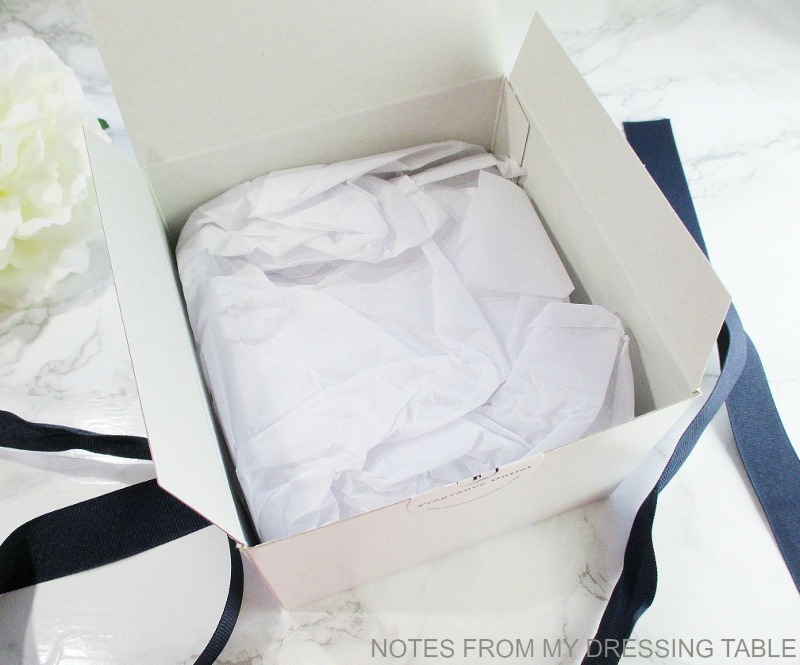 The fragrance in it's box was wrapped in white tissue paper. There was a lot of air space, allowing the fragrance to be jostled around in it's outer box. I would suggest wadding some of the tissue and better securing the contents. But then, I always was a big fan of over packing things. Bamboo comes in a beautiful, rounded rectangular, heavy glass flacon with a silver spray top and a sleek, linear silver cap. The flacon is embossed with a pretty bamboo pattern and the fragrance is tinted pink to symbolize freshness. 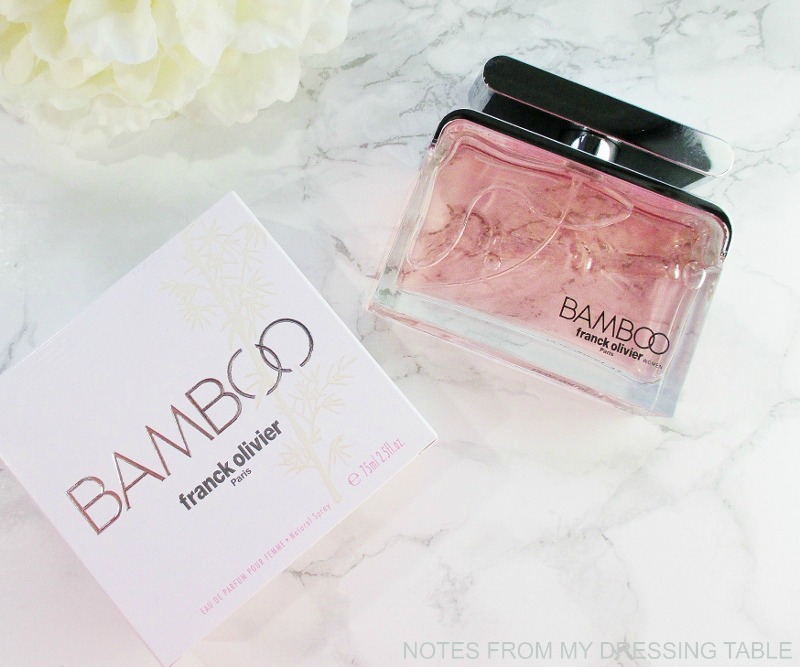 Bamboo is a fragrance type that I normally very much enjoy. A fresh, softly floral scent that is gently grounded with hints of musk. Happily, the Cedar, while a note I'm not wild about is not too prevalent and I don't find it at all objectionable. When I spray on Bamboo, the first thing that happens is a strong assault of alcohol and a chemical hit. As that fades, I can smell the fresh, green notes and the soft floral. The musk, wood and vetiver rounds it out nicely. The scent is very lightweight and not obvious, I smell clean and feminine when I wear it. Bamboo doesn't live long on my skin. An hour and it's gone. Not even a hint of it's presence remains. I can get a little more enjoyment from this scent if I give my clothes and hair a good spritz. The point is, I shouldn't have to jigger a fragrance to enjoy it for longer than sixty minutes! Bamboo has a MSRP of $97.90. The list price is $89.00 and it is frequently included in percentage off promotions. In my opinion, this fragrance, while pleasant and wearable enough is not worth the high asking price and to be honest, I wouldn't repurchase this scent, even at the discounted price. My assessment is, if you want to save a few dollars on well known, name brand and designer fragrances, give Fragrance Outlet a look. They are easy and fun to shop with. I recommend that you skip the company exclusives, if they are all the same quality of Bamboo. Have you shopped with Fragrance Outlet? How was your experience? What fragrance (s) did you purchase and are you happy with them? Please, do share.